Krispy Kreme will be adding some holiday flair to their signature Original Glazed Donuts, but only for one day, when the new Gingerbread Glazed Donut appears on Tuesday, December 12, 2017, at participating locations in the US and Canada. The new donut features spiced (with cinnamon and ginger) gingerbread dough fried fresh and covered in a warm gingerbread molasses glaze. While the chain has been recently changing the dough or the glaze of their trademark donut for limited-time donuts, this marks the first time that they're changing both the dough and the glaze. As to why December 12, it just so happens to be National Gingerbread House Day. 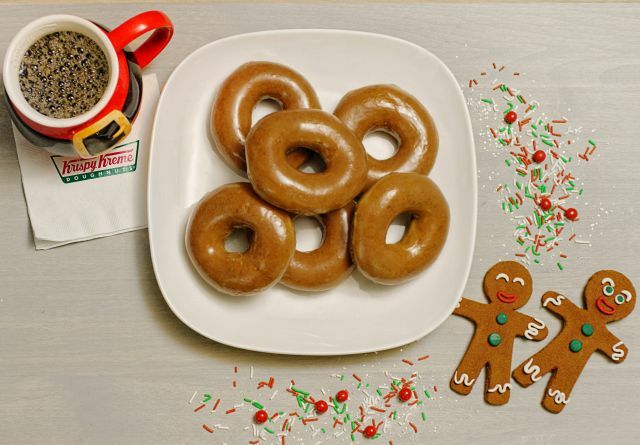 You can find a list of participating shops on the Krispy Kreme website here.